It's been four years since I last wrote about music players. In the meantime ⅔ of my Sansa Fuzes broke, and the third does not have great rockbox support. I've also been using a Sansa Clip+ (a leaving present from my last job, thanks again!) and a Sansa Clip Zip. Unfortunately Sandisk's newer Sansa devices (Sport, Jam - the only ones still in production) are not supported by Rockbox. The Clips have been very reliable and sturdy players, but I have missed the larger display of the Fuze. Since I've been exploring HD audio I've also been interested in something with an A/D converter that can handle it. I also still wish to carry my entire music library around with me, which limits my options. I decided to try an iPod. The older iPods had a Wolfson-manufacturered ADC which had a good reputation and supported (in headline terms at least) 24/48. 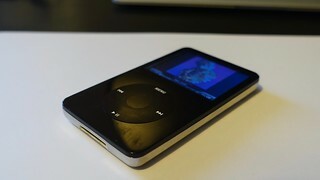 The iPod colour (aka "4th gen") and subsequent models have a large colour display. The click-wheel interface is also very nice. Apple have now discontinued the "classic" iPod and their second hand value has greatly increased, but I managed to get an older 5th generation model ("video", with a base capacity of 30G) whilst trading in some unwanted DVDs. The case was scratched to heck but a replacement was readily and cheaply available from auction sites. Rockbox support in these iPods is pretty good, and you can mod the hardware to support CF or SD cards with kits such as the iFlash kits by Tarkan Akdam, which I picked up, along with a new 128G SD card. Unfortunately I have found writing to the iPod to be very poor with Rockbox, but it's fine for playback, and booting the iPod in OF or DFU mode is very easy and works reliably. Whilst Rockbox on the iPod works pretty well, installing it is far harder than on the Sandisk Sansa devices. 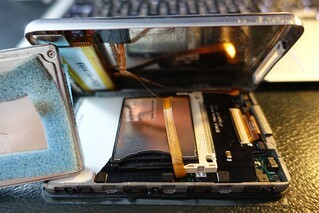 The difficulty in my case is because rockbox requires a PC-formatted iPod to install, and I had a Mac-formatted one. I couldn't find a way to convert the iPod to PC format using a Mac. I tried doing so on a PC but for some reason the PC wasn't playing ball so I gave up after a few hours. In the end I assembled the filesystem by hand using dd(1) and dumps of partition tables from other people's iPods, via a Linux machine. This was enough to convince iTunes on Mac to restore it's hidden partition and boot software without reverting back to a Mac disklabel format.